OK, I know that they're not really twins, but don't they look similar. Jim has a big head, and Joe is so skinny. 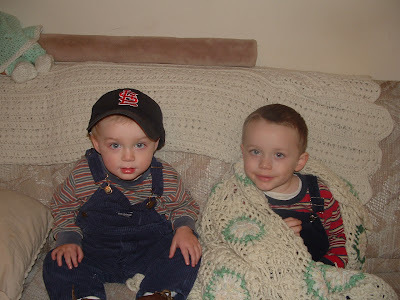 And yes, I did dress them both in Overalls and stripes on purpose. I do like them to match. I like it even better when all of the kids match. Aren't I obsessive?